Kensington bedroom collection. This bedroom set in java finish and glossy silhouette takes residence perfectly in a loft apartment environment. The simplicity of the industrial surroundings adapted for modern urban living has become popular in many trendy neighborhoods. Loft apartments are one component of municipal urban renewal initiatives that give residents an opportunity to live in the heart of the arts district. 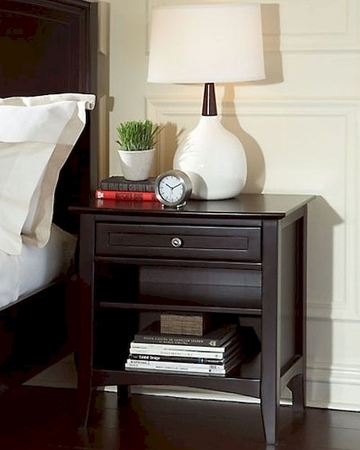 Night Stand - 28"L x 20"D x 29"H.
Constructed of Solid wood & wood veneers.